Between the uncertain political climate, the rising international hostilities, concerns about a changing climate, and a general feeling of unrest, it seems like the end of the world might be any day now. Of course, bunkers filled with survival supplies are ideal, especially in worst-case nuclear scenarios; however, not everyone can afford a shelter, and sharing with others might mean diminished supplies for those residing in the bunker. In short, it is not sustainable. For long-term survival, it is best to learn skills, like procuring wild food or making your own weapons. The bow and accompanying arrows are an important part of your post-apocalypse arsenal–they are effective weapons that are easy to make and fix, and can quickly fell prey and hostiles effectively. This article will give you some tips on bow hunting and explores how to make your bow and arrow using only a knife and materials found in the woods. Bend the twig a little bit and let it snap back. Does it return to position slowly or does it snap right back quickly? If it’s the former, reserve it for kindling and look for another twig. If it’s the latter, continue to the next step. Bend the twig into a C-shape. Is it able to handle being bent in that position or does it break? If it breaks, then toss the pieces on the ground. If it’s intact, continue to the next step. Try to break the twig. If it breaks easily, then throw it on the ground, just like before. If it refuses to break, then it’s perfect. If it eventually breaks, but only after significant effort, then you’re probably okay, but keep an eye out for better. Once you’ve found a twig of the right sort of wood, then find a sapling of the same species. You want the sapling to be about ½ inch thick at the thinnest end, and ideally, you want it free of knots and branches. This piece of wood is called the stave, which you will use to make the bow. Take the sapling and mark the approximate spot where you want the center of the bow to be. Then trim the stave so that each of the limbs is the same length, tapering as you go. Avoid cutting into what will be the back of the bow as much as possible. When it looks like the two sides are about the same length and are tapered equally, then you want to make sure that limbs bend equally. To test this, place the bow upright against the ground. Hold the tip at the top, and then push down into the top of the handle and gauge how much it bends. Then do the same with the other side. If it bends equally, then you’re ready to continue to the next step; if not, then keep modifying the ends until they do. Next, you want to prepare the bow for the string. To do this, you’ll cut two notches at 45-degree angles, which will help keep the bowstring from slipping off the bow. Next, you’ll attach the bowstring. You want a thin rope, cord, or string that is strong and has a small diameter. If you happen to have a rope or synthetic cord handy, then that is ideal; if not then use a natural material. These can be thin pieces or saplings, like dogwood. Vines like honeysuckle, wisteria, crepe myrtle, or kudzu are excellent choices, as are other plant matter like yucca, dogbane, or nettle. Then, string the bow. The brace height, or the distance between the deepest part of the bow and the cord, should be about five inches. If you end up needing to experiment with making more bows at a later date, then you might want to think about adjusting the brace height. 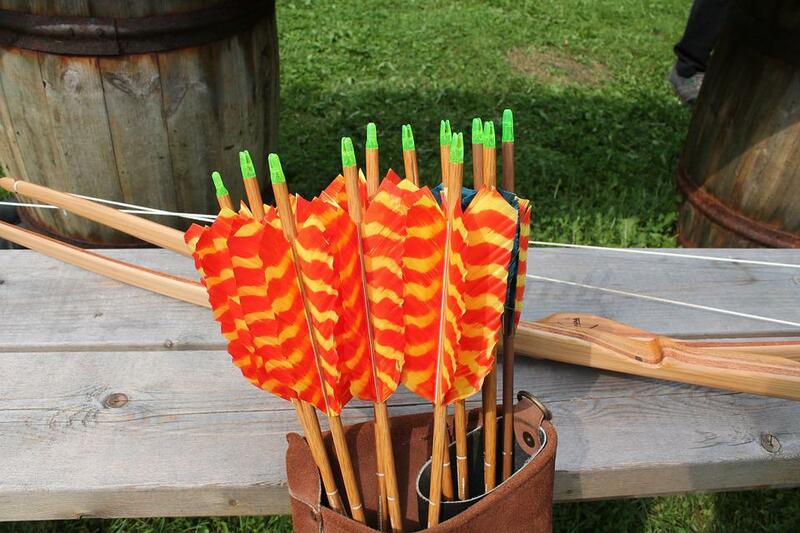 The shorter the brace height, the less forgiving the bow will be and the faster the arrow will travel. The converse is also true: longer brace heights equate to more forgiveness in accuracy and slower speed. Without arrows, the bow is just a curved piece of wood with a string. The arrows are what make it a weapon. Luckily, you can create makeshift arrows from many materials in the woods; all you need is a knife or rock to fashion the arrow, fire, and something to make the fletchings out of (these are the feathers fastened on the thick end that help to balance the arrow). First, gather wood. You’re looking for long and thin shoots or twigs that are as straight as possible and free of knots or branches. The smallest end should also be thick enough to sustain a notch without compromising stability. Once you have your wood, you’ll want to scrape the bark from the wood using a knife or stone, and then straighten the shaft if necessary. To do this, hold the shaft over a fire or heat source, then bend it into the desired position until the wood cools. Next, you’ll want to sharpen the larger end to a point. Now return to the smaller end. Notch it so that it fits snugly against the arrow. You also want this to be as smooth as possible, as not to catch the cord. Finally, you’ll fetch the arrow by fastening feathers or pine needles to the end. Plant fibers, thin vines, rawhide, or anything of the like make excellent cords to attach the fletchings. Repeat the above process until you have the desired number of arrows. You now have a functional bow and some arrows with which to hunt in the post-apocalyptic future. Now all you’ll have to do is figure out what to do with all of those skills to get the maximum use out of them. Mastery of these skills will not only ensure survival, but they will give you valuable goods and expertise to impart to others, either out of the goodness of your heart or for a price. How to Choose the best Bipod height for your safety?